Restrained glamour was the overarching trend set on the 2016 Golden Globe red carpet, indicating a welcome shift in award show fashion. The jokes of host Ricky Gervais may have been scandalous, but the red carpet was pleasantly free of any truly head-scratching moments. The stars of film and television ventured to the Beverly Hilton for good drinks, good laughs, and good company. Oh, and some of them even won awards. Cool! On the red carpet, things were sophisticated and glamorous, with no one going too over-the-top (except maybe for Jane Fonda's overwhelming ruffled frock) but rather showing a bit of restraint when it came to gown selections. Body-hugging column dresses and simple (but exquisite) design details made this year's red carpet an overwhelming success, though without any major jaw-dropping moments, either. But that's okay. I'd rather have everyone look good and struggle to find worst dressed candidates than struggle to weed out the successes from the flops. My favorite looks followed a pattern, with most of them being either gold, white, or red dresses. I loved seeing so many white dresses; even though it's the dead of winter, we are still in Los Angeles. I always hate it when actresses think winter awards show=black dresses, because black dresses can be very challenging and often very boring. So good for you, Hollywood starlets, for picking gorgeous colors! 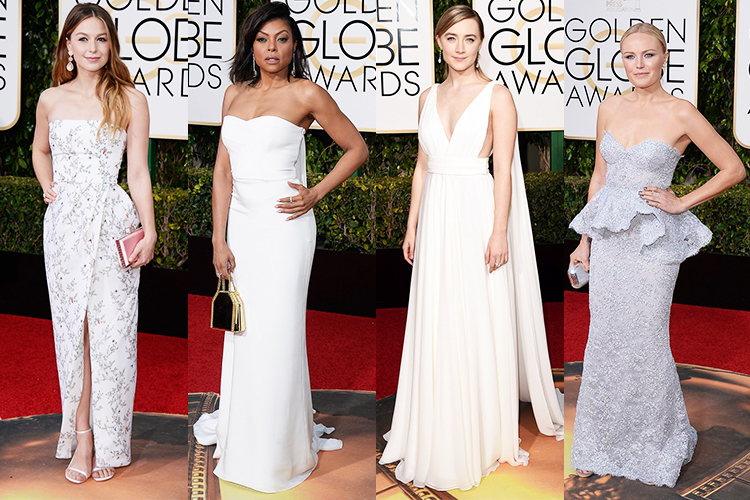 Who did you think was the best dressed at the 2016 Golden Globes? Let me know in the comments! Great round up!!! Loving all of this! Corinne Foxx was such a stunner!! Definitely one of my favorites! I loved the details on her dress! I almost missed the red carpet since I was driving back up to school for the start of spring semester, but luckily caught most of it (and the recaps online!). Glad you enjoyed! Me too! Did you see her Instagram of the back of the dress? Seriously to-die-for!